Necrotic enteritis (NE) affected flocks have poor enteric health and nutrient digestibility leading to decreased performance and increased excretion of nutrients. Evidence suggests that there is an association between diarrhea, wet litter and NE but it is unclear whether the occurrence of NE leads to wet litter or vice-versa. If NE affected birds produce sticky droppings, diarrhea or wet litter, then NE may exacerbate odour emissions. 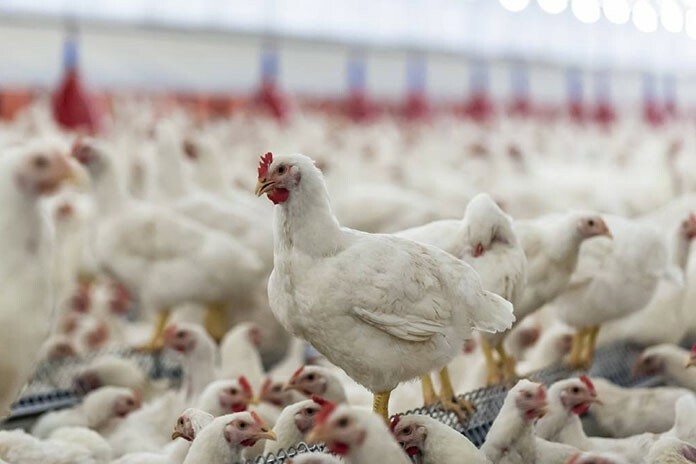 This study was conducted to investigate the effect of sub-clinical NE and wet litter on litter headspace concentration of odorants in a broiler house. A total of 160 day-old Ross 308 male broiler chicks were assigned to four dietary treatments each with 4 replicates of 10 birds/pen (pen size: 1.2 m x 0.65 m up to d 10 and 0.84 m x 0.60 m thereafter) with fresh pine shavings as bedding material. A litter collection tray measuring 0.46 m x 0.29 m x 0.065 m was placed in each pen away from the feeder and drinker before litter was spread over the pens covering the tray. A 2 x 2 factorial arrangement of treatments was employed in a completely randomized design to study the effect of NE challenge (no, yes), dietary Na level (1.6 g/kg, 4.0 g/kg) and their interaction on litter headspace concentration of odorants. The high Na diet contained a high level of salt to produce wet litter condition. On d 20, odorants were collected from litter headspace with a flux hood and measured using selective ion flow tube mass spectrometry (SIFT-MS). Data were subjected to two-way ANOVA and means were separated by Tukey’s HSD test at P < 0.05 using SAS JMP v.8 software. Odorant concentrations were log transformed before analysis. On d 33, while challenge did not lead to higher mortality, it reduced feed intake by 5.48 % (P < 0.05), body weight gain by 9.02 % (P < 0.01) and increased FCR by 5 points (P < 0.01) indicating the presence of subclinical necrotic enteritis in challenged birds. Challenge increased (P < 0.01) litter moisture and litter headspace concentrations of dimethyl sulfide (P < 0.05), propyl mercaptan (P < 0.05), total butanols (P < 0.05), acetoin (P < 0.01), skatole (P = 0.05), butyric acid (P < 0.05), methyl amine (P < 0.05) and tended to increase concentrations of ethyl mercaptan (P = 0.07), carbon disulfide (P = 0.09), indole (P = 0.10) and formic acid (P = 0.10) compared to the unchallenged group. The birds fed high Na diet produced higher litter moisture (P < 0.01), wet litter and higher litter headspace concentration of sulfur compounds and phenol (P < 0.01) compared to those fed normal Na diet. In the birds fed high Na diet (that produced wet litter), challenge increased the litter flux of some additional odorants which included 2,3-butanedione (P < 0.05), acetic acid (P < 0.01), propionic acid (P < 0.01), isobutyric acid (P < 0.01), isovaleric acid (P < 0.01), pentanoic acid (P < 0.05), 2-butanone (P < 0.05) and 3-methyl-1-butanol (P < 0.05). These findings suggest that both wet litter and sub-clinical NE may increase the odour nuisance potential of broiler farms. Sub-clinical NE affected broilers may further increase odour emissions if the disease comes together with wet litter condition.